Ah, Brazil. Home of the Amazon and a rather good football team. And they grow coffee. And the World Cup is being held there soon. Most people’s knowledge of Brazil doesn’t go beyond that. Which is a bit pathetic really, considering it’s the world’s fifth biggest country in terms of size and population. 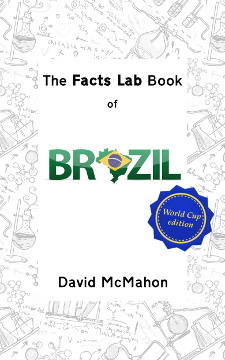 If you’d like to know more about Brazil than what time the matches are on television next June and July, The Facts Lab Book of Brazil: 101 amazing facts about Brazil and the Brazilians is a carnival of information about the country and its people – some of it useful, some of it arcane, all of it entertaining.